DIEBENKORN, Richard (1922-1993), Oregon-born painter who taught at the California School of Fine Arts (1947-1950). Diebenkorn helped to define Bay Area sensibility before and after his teaching years in Los Angeles. According to an article in the New Yorker, Diebenkorn was one of the last artists left who sustained the grand authority of American abstract painting of the fifties. Diebenkorn met Carey Stanton (1923-1987), whose family owned Santa Cruz Island, when the two were freshmen at Stanford. Diebenkorn was already bent on the artistic life from the beginning, and Stanton entered the pre-med program at Stanford, determined to become a doctor. They became close friends during their undergraduate years together, and their friendship remained strong throughout their lifetimes. Stanton, who referred to him as “Witz”, was best man at Diebenkorn’s wedding to Phillis Gilman in Santa Barbara in 1943. After getting his medical doctorate in 1947 and after nearly a decade of medical practice, Stanton moved to Santa Cruz Island to manage ranch operations. Over the next 30 years, Diebenkorn and his family made frequent island visits. Stanton began to acquire Diebenkorn's work, eventually accumulating 45 pieces. Many of the works were painted on Santa Cruz Island. The intimate but intense Diebenkorn works chart friendship between the artist and Carey Stanton. 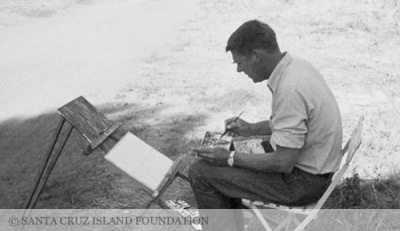 After Carey Stanton's death in 1987, the collection of paintings became property of the Santa Cruz Island Foundation, which Stanton established in 1985 to preserve and document the culture of the Channel Islands. Flag of Santa Cruz Island was designed by artist Richard Diebenkorn for Carey Stanton in 1958. It depicts the 19th century island symbol of a cross on a hill, flanked by green pastures and blue sky and ocean. It flies on the island, at the Santa Barbara breakwater, and at the office of the Santa Cruz Island Foundation. Santa Cruz Island is the only California Channel Island with its own flag.